60cm/24” around x 20cm/8” deep. Customisable. 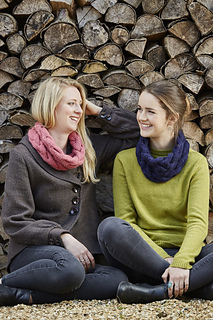 Join our Cosy Cables KAL starting 1st Nov and get ahead with your gift knitting this year. And there are prizes to be won! 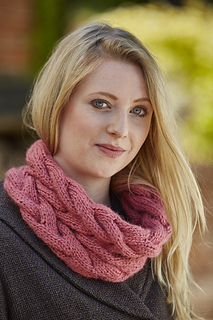 A twisting, twining cowl with deep cables. 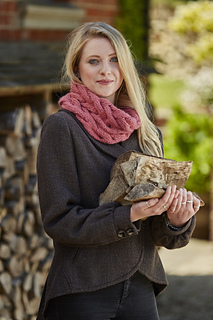 I love the deep shadows and rich texture of Umbra; I feel warmer just looking at this cowl. The idea of wearing it come winter makes me smile. I’ll be ready. 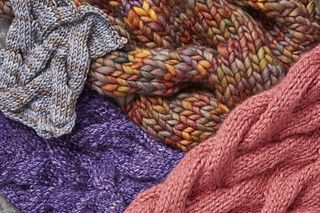 Choose a pop of colour you love, or knit more than one! Knit flat in bulky yarn, this is a quick and easy cable project. It’s a great gift-knit. You can make a regular cast-on and seam it closed, or make a provisional cast-on and graft it together. This is an easy intermediate project. BOTH written instructions AND a chart are included for the cables. At the end of every pattern in Knit Play Colour, you will find ideas on how to “play” with the design. Play with the weight of yarn, colours and sizing on this little project – for dramatically different results. All the help you need in changing the yarn weight you want to use is in the Play section following the pattern. I recommend DK/light worsted through to super-bulky yarns. Eden Cottage Yarns Whitfell Chunky (100% baby alpaca, 100m/109yds per 100g skein) 2 x Echinacea (pink). The Fibre Company Tundra (60% baby alpaca, 30% Merino wool, 10% silk, 110m/120yds per 100g skein) 2 x Diablo Beach (blue). 14 sts per 10cm/4” over Stocking Stitch/Stockinette using 6mm/US 10 needles or size needed to get gauge. 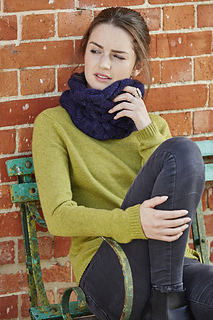 Go super-bulky in Malabrigo Rasta in Piedras (autumnal colours). For more about playing with this pattern, including these ideas, visit the Umbra blog post.